Marine Travel Hoist Manufacturer Supplies Light Duty Travel Lift Heavy Duty Travel Lift For Sale! They Include Electric Boat Hoist Hydraulic Boat Hoist! Marine travel hoist is great choice for lifting boat. 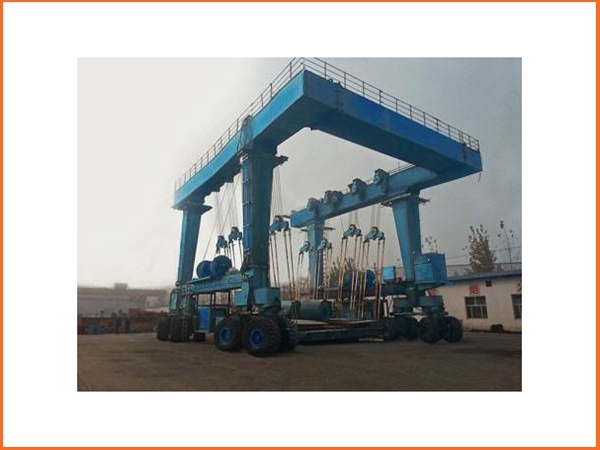 It has large loading capacity, customers can choose suitable lifting tons according to practical condition, such as 10 ton travel lift, 25 ton marine travel lift for sale, 60 ton boat hoist, 100 ton marine travel lift for sale, 500 ton mobile boat lift gantry crane, 1000 ton marine travel lift. All these cranes have complete safety protection devices. Ellsen, a well-known marine travel hoist supplier and manufacturer in China, provides top quality travel hoists with many advantages, such as flexible move, convenient use, easy operation, high safety, durable material, terse structure and fast maintenance! Want to increase efficiency, save energy, spend less cost? Just purchase cost-effective marine travel hoists from Ellsen now! Seize the chance and get more benefits! Boat travel lift is used for handling and transportation. It is mainly composed of frame structure, hoisting mechanism, steering mechanism, hydraulic transfer system, electrical control system and wheel sets. The main structure is designed as box shape with high strength, it is able to transport boats those are much higher and longer than the crane itself. According to clients’ demands, electro-hydraulic transmission and electric system are both available for options in hoisting and travelling parts. Hydraulic system has features as small volume, light self-weight, compact structure, smooth running, quick response, small inertia, easy operation and automation. Electric hoisting system has advantages as outstanding cost-efficiency. The crane has high-speed start brake and turn. Multiple lifting points work simultaneously to avoid load skewness or strong pressure on the hull and possible damage or accident. Space between hoisting points is adjustable to fit boats with different dimensions and automatically adjust the deflection angle for adaption. Pivot steering is designed for maximum option of space and flexible work. The steering is convenient to use and stable to move.